Here's a piece I dug out from portfolios of days gone by. 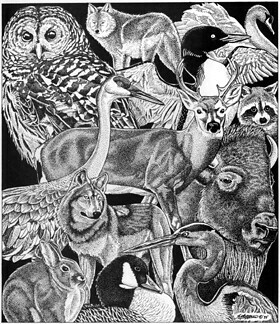 It was created in pen and ink using the stipple (tiny dot) technique. This piece represents the peak of that style for me. At the time I felt like there wasn't much I couldn't illustrate in that style. It wasn't long after that that I felt the need to change illustration styles to be more marketable (ie. working in color). That dot stuff looks real cool, maybe I should try that sometime. You should, it's such a harmless technique.